*Warning – This post is for Sound of Music nerds only. While in Austria we couldn’t pass up the opportunity to stop by Salzburg, famous for the movie The Sound of Music and for being the birthplace of Mozart. 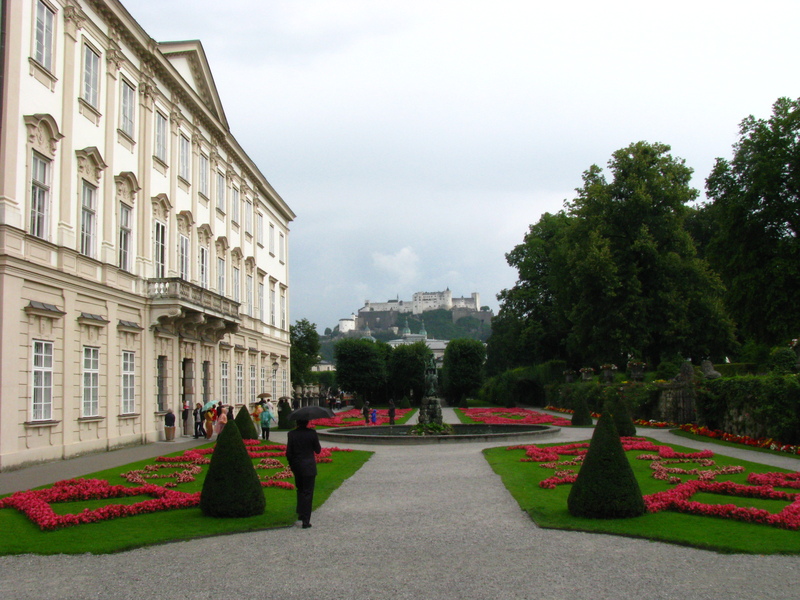 Of course, I was super excited to visit all of The Sound of Music haunts. Unwilling to fork out the outrageous tour price, we attempted to find spots made famous from the movie on our own. I admit, we were not too successful. I walked around the outskirts of Maria’s abbey, only to discover that I couldn’t visit the cemetery where the von Trapp family hid from the Nazis. We bought tickets to go inside the building where the family performed in front of the Salzburg community. Unfortunately, as soon as the tour was about to start the tour guide got word that the hall was needed immediately as a rehearsal space. We DID find a fountain the children ran around while learning to sing, the arch covered in vines that they biked through, as well as the glass gazebo where Liesl sings “16 Going on 17” (only you can’t go inside the gazebo and it’s not even located where it was filmed!) Had my sister Ali been here I know we would have reenacted many scenes. Unfortunately, Matt was not as game. We even took a cable car ride up the mountain where the opening and closing scenes were filmed (opening scene – Maria sings her heart out in the mountains; closing scene – the von Trapps hike through the mountains having just escaped the Nazis). I was hoping to belt out some tunes under the mountain sunshine. But on the way up a cloud suddenly engulfed the cable car and we couldn’t see anything. Apparently the von Trapps averted the Nazis by disappearing into the clouds as they crossed the Alps. In other news, we went camping! It rained every night, but our tent is getting used to it. We visited this incredible garden famous for its “trick fountains”. What a thrill! Every July-August Salzburg hosts this huge music festival. We didn’t pay to see any operas, but last year’s festival was available every day, for free, on a large screen set up in the town square. This delightful town really was alive with music around every corner. Written by: kate on July 31, 2011.on November 27, 2011. Matt! I’m thoroughly disappointed in you! I can’t wait to see pictures of this!